After reading the latest issue of Matchbook Mag later than I normally do, I was pleased to discover that the adorable illustrations throughout the magazine are by Kristina Hultkrantz. She has a great amount of beautiful small and large illustrations to peruse through and choose from in her Etsy store, Emma KissTina. 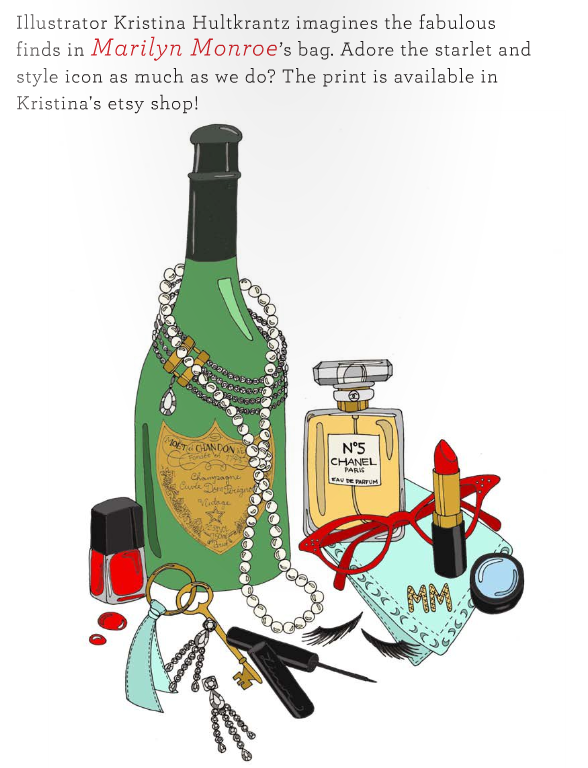 She has cute illustrations all throughout Matchbook and my favorite is always the "What's In Your Bag?" 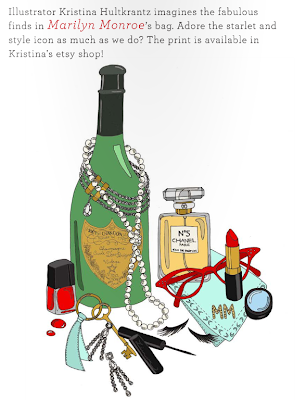 feature, where Kristina sketches out what she pictures to be in a famous, fashionable lady's bag. The latest issue featured Marilyn Monroe's supposed bag, seen above. If you are looking for a great gift idea for the upcoming holidays for a classy lady, consider some of the larger posters in her collection. Or if you just need unique and special stocking stuffers, the little prints would be adorable. Here are some of my favorites, even though it was hard to choose! Macarons, so delectable and so chic.